The leather chest was used to guard the gifts, donations and money sent to Hejaz via the Surre Procession. Made in 1897 by a leathersmith from Gaziantep, a leather chest was sent to Hejaz with the Surre Procession every year during the Ottoman Empire. Now, it is a focus of interest for the visitors at the Gaziantep Art Center where it is currently being exhibited. Opened for the 97th anniversary of Gaziantep's liberation from enemies and offering pieces that depict Gaziantep from the Ottoman and Republic period, the City Archive at Gaziantep Art Center hosts many important documents and works. Presenting many postcards sent by French soldiers to their families during the occupation years, nostalgic newspapers, magazines and photographs, donations made by the people of Gaziantep during the making of the Hejaz Railway, along with appointment documents attracts the attention of those interested in archive studies particularly. Including facsimiles of the spiritual court records, the archive has a leather Surre chest made by the Kanberzade family from Gaziantep in February 1897. The chest, which has the statement "Böyle üstad-ı yegane-i Ayıntap, Kanberzade demekle şöhretyab" ("The unique master of the city of Antep, is famous for his title, Kanberoğlu") on it, was used to guard the gifts, donations and money sent to Hejaz via the Surre Procession. Gaziantep Metropolitan Municipality Assistant Secretary General Oya Alpay spoke to Anadolu Agency (AA) and said that the City Archive, which presents records on the social, economical, administrative and cultural values of the city and documents its history and daily life, opened in 2018. Alpay noted that the archive consists of digital photographs, documents, audiovisual materials numbered around 62,000 in addition to around 2,000 printed media, books and periodicals. The archive also includes documents from Ottoman times, the Republic period and general staff archives about Gaziantep. 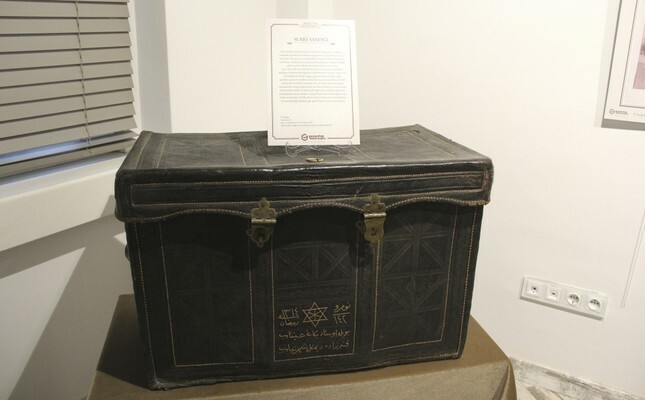 Consisting of the donations and gifts prepared to supply the needs of Hejaz people every year before Hajj season in Ottoman times, the Surre Procession chests used to be made by masters from Gaziantep. Alpay said that they came across one of those chests at a collector's auction and bought it. Alpay said that they exhibit the Surre Procession chest at the center. "The Surre Procession is an Ottoman tradition. It is thought to have been initiated by Çelebi Mehmed in the 1400s. As a result of the sympathy Turks and Ottomans had for the Hejaz people, they sent Hejaz gifts every year on the 12th of Rajab a date in the Islamic Hijri calendar. It is also known that, Bayezid I - the father of Çelebi Mehmed - sent 80,000 gold coins to the Hejaz people. "The Surre chests, which were of great importance then, were known to be made by the Kanberzade family from Gaziantep. In that period, most of the Ottoman provinces prepared gifts for the Surre Procession and the Kanberzade family from Gaziantep was one of them. By the way, we want to call the grandchildren of the Kanberzade family and say that we would be very pleased to see them at our center." Stating that the Surre chest attracts a great deal of attention by visitors, Alpay said, "We invite everyone who wants to see the chest to the City Archive at Gaziantep Art Center. The archive will be a satisfying source for those who want to research." Calling out to those who have any material, Alpay said, "We are also open to any documents about Gaziantep. Please do not hesitate to contact us if you have any."